This bank is 4-7/8" tall, 4-1/4" wide, and 2" deep. It has a painted silver finish with a very deco skyscraper motif. There is a keyhole in the bottom, as well as slots for bills and for coins. These small banks were distributed by the local community banks for their customers, and the keys were generally held by them. Hopefully, the customer would take their bank in, have it opened, and then deposit the saved funds...ready to save all over again! This bank has a picture frame on one side, which has a thin mylar cover. 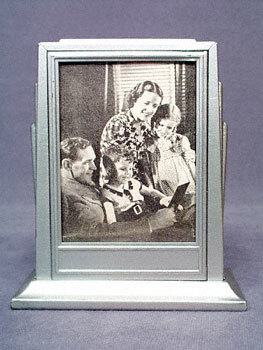 The family picture is probably original to the bank, and is a halftone print on a newsprint type of paper common in photo frames of the era. The back has a textured green plastic plate, with embossed figures of coins, cash, and a money bag. There is some minor scuffing, but overall, this piece is in very good condition, and a great example of deco styling. Please be aware that this item is the bank only, there is no key!